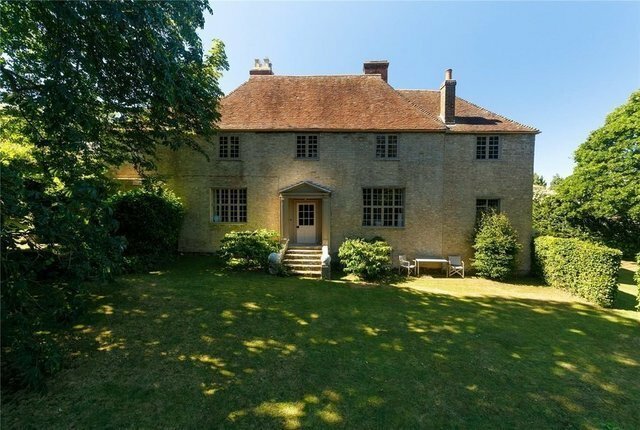 Wellbrook Farmhouse is an enchanting family home of great style, with a wonderful and laid-back atmosphere that works well with the more formal structure of the house. The building is listed Grade II on account of its historic interest, and dates from the 16th Century. The elegant symmetrical façade was most probably added circa 1800 and is hung with pleasing mathematical tiles, mimicking a yellow stock brick. The generous accommodation is arranged over two floors with a cellar, and has a number of elegant rooms arranged around a pair of central staircases. The day-to-day entrance is to the kitchen/breakfast room which runs across the rear of the house and is open to the full height of the catslide roof, giving a spacious airy feel. There is a well fitted kitchen area and ample space for a table. A raised area provides for additional seating and opens to the garden. The main rooms are found to the front of the house, and are of similar proportions, each with a fireplace and the elegant style associated with late-Georgian architecture. A large study is found to one side and the workshop to the north could perhaps be incorporated into the living accommodation if so desired. A cloakroom and utility room complete the ground floor. The same elegant and easy style continues on the first floor, which can be approached by either of the two staircases, and has six generous bedrooms arranged around a substantial central landing which doubles as a study or bedroom. There are also five bathrooms, the largest being extremely spacious and decorated in a stunning peacock blue. Wellbrook Farmhouse is set in a carefully laid out and manageable garden. There is a parking area close to the back door, and lawns and mature trees surround the house. A little used public footpath divides the main garden from the lower garden.